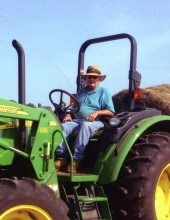 Jimmy Christopher Romine, 77, of Rogersville passed away Monday, January 14, 2019 at his residence. He was a 1959 graduate of Lauderdale County High School and a farmer for most of his life. A visitation will be held Saturday, January 19th from 2 – 4 p.m. at Rogersville Funeral Home. Jimmy was preceded in death by his parents, P.O. & Sarah Romine; siblings, Barbara “Tean” Cox and Doyce Danny Romine. He is survived by his son, Prentiss (Jennifer) Romine; grandchildren, Levi Romine and Lake Romine; brothers, Donnie (Susan) Romine and Doug (Judy) Romine; sister, Sue Forsythe; numerous nieces and nephews. The family would like to thank Comfort Care Hospice and nurse, Sherry Cochran. Rogersville Funeral Home is assisting the Romine family. To plant a tree in memory of Jimmy Christopher Romine, please visit our Tribute Store. "Email Address" would like to share the life celebration of Jimmy Christopher Romine. Click on the "link" to go to share a favorite memory or leave a condolence message for the family.